One of the highlights of our trip through Indonesia certainly was the Kelimutu National Park on Flores. In the middle of beautiful nature you will find three very different crater lakes, with a couple of legends to it. 50 kilometers east from Ende you will find the Kelimutu National Park. 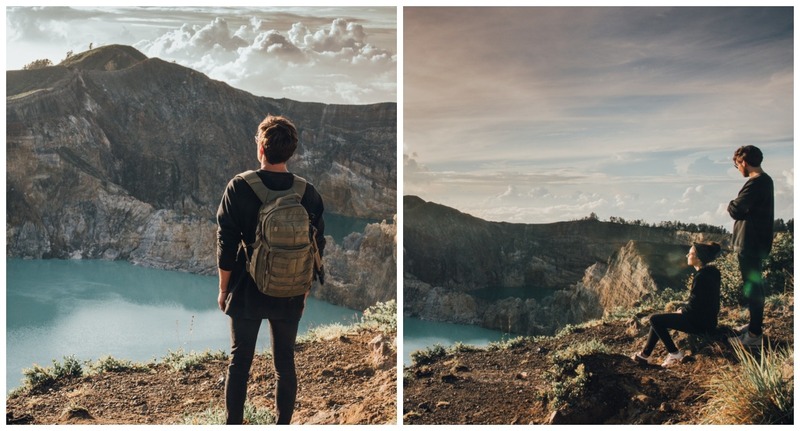 The area inhabits the Kelimutu volcano as well as its three different colored crater lakes. Kelimutu also made it to the Ribu’s List with volcanos higher than 1,000 meters. The word Keli means “Mountain” and the word Mutu “boiling“. 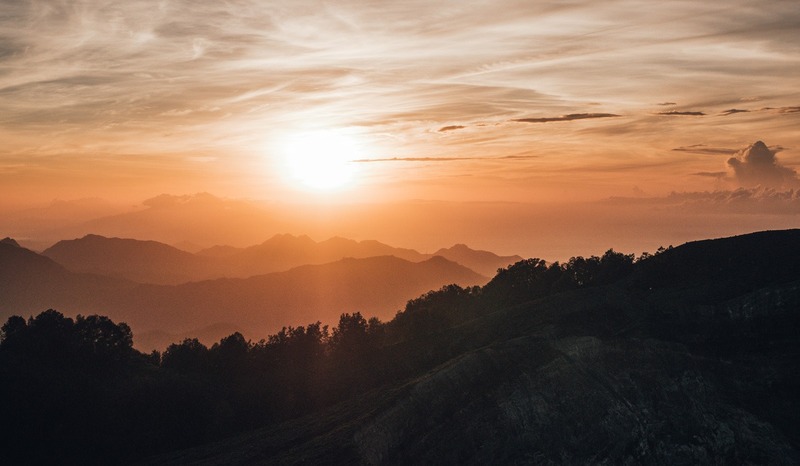 However, the boiling mountain is rather famous for it’s color play during sun rise than its activity, as the last eruption took place in 1968. One of the crater lakes is located roughly one kilometer west from the other lakes. Here, a face of rock separates the three lakes. This lake is called Tibu Ata Mbupu and used to be dark blue, changed its color to almost black, than transformed into a white-green for a short while and now you will find him colored in a very dark brown. Legend says it’s the lake of the old. The two lakes located beside each other are called Tiwu Nuwa Muri Koo Fai – the lake of children – and the Tiwu Ata Polo, the charmed lake. The first one used to be turquoise , then became dark blue and is colored in a light green today. Polo, in contrast changed from a red color into a darker green or brown. The changing color of the lake is no mystery but explanatory with the activity of the volcano and the release of minerals. In Flores locals believe that wandering souls are the reason for the changing colors. 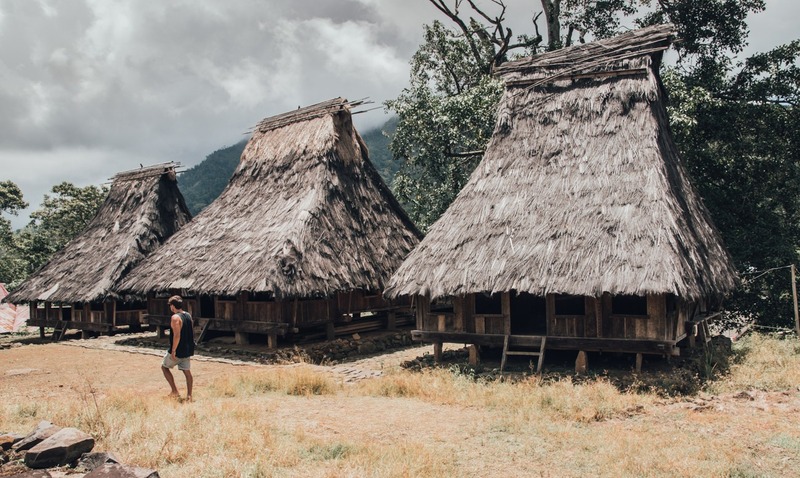 While traveling to the Kelumutu National Park it is highly recommended to stay in the village of Moni, don’t waste time in Ende. When we say “village” we really mean village. You won’t find anything beside a main road, a couple of hostels, two or three restaurants and a handful of locals. And exactly that made Moni so authentic and a lovely place to stay in. Choices are limited, it’s located inmid of lush green mountains. It seems, time stands still in Moni. Be aware that everything is a bit more expensive in Moni. Accommodations for example, are a couple of bucks more expensive as in Labuan Bajo. As well as that, you should book in advance. Due to the fact that choices are limited, places to stay also are. Especially during high season! The family owned Mahoni Guesthouse* is located at the main road of Moni. The tiny guest house can accommodate four people at a time. In the time we have been there a third room was renovated, so that a third couple would find a place to sleep. The owner is extremly friendly and his grandma makes great coffee and delicious pancakes. The rooms are clean, you will find everything what you need, but not a lot more. Here, we stayed two nights. Julian loved to sit on our little terrace, peeling some fresh fruit and overlooking the village and its inhabitants. As the Mahoni Guest House was taken for the other two night we stayed in Moni we moved to the Bintang Lodge*. The accommodation is – how could it be different – located at the main road of the village and has a few more rooms to accommodate visitors. Rooms here are a bit more spacious and have, depending of prices, also warm-water showers. The Bintang Guest House is a bit more pricey than the Mahoni Guest House, which also makes sense in comparison. The alarm screamed at 3:40. Our sleep was over from one second to the other. It was still dark, our eyes sleepy. Our taxi arrived a few minutes later to one of our highlights while backpacking in Flores. We washed our tired faces, grabbed the most important things jumped into warm clothes and hopped on the taxi. Tip #1: We shared the 35 minute ride to the parking area of the national park with two locals we met in the evening before. As the taxi drivers aren’t really in the mood to get up that early as well, the prices are pretty high but we weren’t into starting the hike around 1:30am. Together with the two locals we paid a reasonable price so try to get a couple of people together for the drive. Half an hour and some Indonesian “Schalgermusic” later- our driver was in a pretty good mood for early time of the day – we arrived at the parking area. Before that we passed the gate and payed the entrance fee. As in many touristy areas not as dirt cheap as you might expect. The dark trail started! Equipped with two flashlights (yeah, we learned from our hike in Myanmar) we went up the first stairs. 30 minutes walking and we arrived at the top. Tip #2: As the trail isn’t lighted, flashlights are a big plus. And even if the days are hot, really take a pullover with you, it’s getting cold up there. Last stairs in front of us. We arrived in the pitch dark at the top, got a hot Kopi and found a good spot for the upcoming sunrise. Every minute the sky changed. From a pitch dark to a dark blue and then the first sun beams illuminated the sky in a magical orange. Of course, we needed capture these incredible moments but then we leaned back and relaxed with the cameras in our hands. Once the sun was there it became significantly warmer, we changed and decided to walk the way back to Moni. Tip #3: Be aware of the monkey’s. Shortly after the sun came out, the little culprits also woke up and strolled around. The little devils are scared of literally nothing and love to attack and steal food and other belongings. The way back would have been included in the taxi ride and our driver waited here. The local couple took the taxi but we started the descent. Depending on which way you choose you are between 2-4 hours on the road. Let’s do it! Passing through green valleys, green paths and a lot more green, first we walked on streets and dirt roads. Later, the way became a path with jungle to its left and right. In the end each of us got a stick to fight through the thicket. This part of Flores is really remote! Passing through two small villages we arrived at our first planned stop, the water fall close to Moni. To get over the river of the water fall you need to cross two adventurous bamboo bridges. We have been scared for a little while, but then saw a very old lady crossing it balancing a bag on their head without any constraints. So we crossed as well! No problems here! After a little break we continued and arrived a couple of minutes later in back in Moni. One of the best breakfasts we’ve had awaited us at our beloved guest house*. On the opposite of the Rainbow-Cafe on the main road you will find a small path. Follow it, cross the bamboo bridge and there you are. At first we were a bit reluctant to cross the bridge but after a couple of times you just walk over it as it would be a normal bridge. No other chance anyway! Tip: On our last day we were unlucky with the weather but when the sun breaks through the trees you have an incredible light for photos. Around noon is a perfect for a good shot. 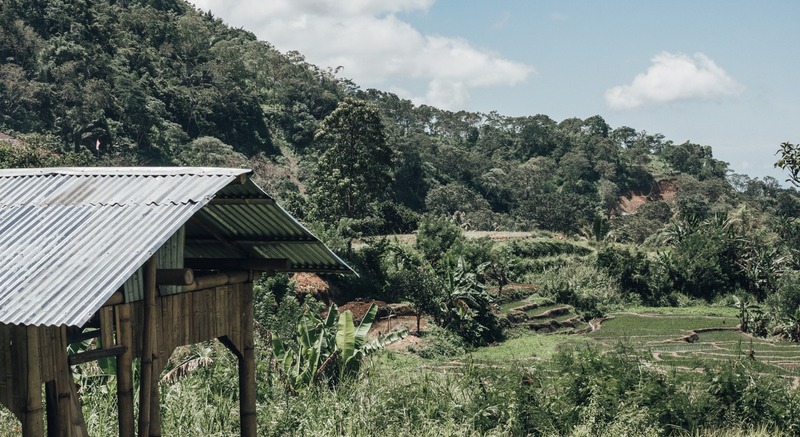 While making your way back from Kelimutu to Moni you will pass by a couple of villages being privileged with great nature surrounding their homes. You are lucky when you see a person in their gardens or hanging around somewhere else. We met two people and one helped us with our way. You shouldn’t miss out on the great fruit markets. Get your scooter and drive 5 kilometers in direction of Ende and you will arrive at a nice local market. 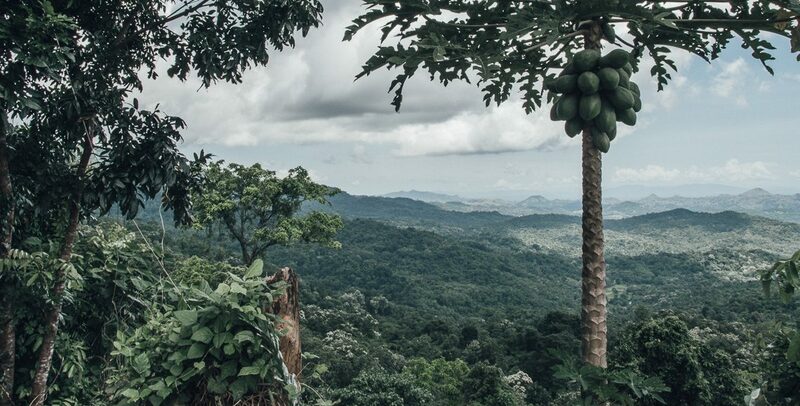 Here locals offer their harvest and you can stock up on vitamines. Every local goes here to buy grocieries and you should definitely try the extremely delicious passion fruits. If you continue to follow the street after the local food market you will come to a fork. Here, you take a right and you’ll come to a traditional village. We strolled around and talked to some locals that have been happy that two Germans seem to be interested in the way they live. In and around Moni you will find a couple of hot springs that are cool to visit. Have a look at our map, here we included two of them. The entrance is in the middle of a village and the inhabitants are happy to receive 50 cents fee. The choices in Moni are limited. 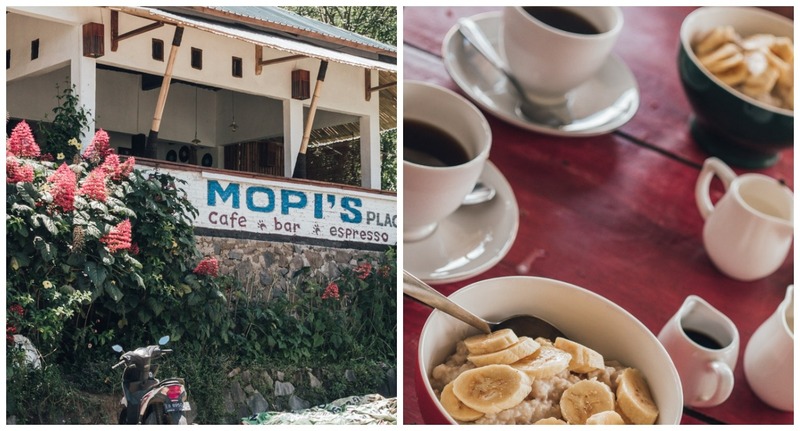 But with one restaurant we fell in love with: Mopi’s. We have been here almost twice per day had coffee, porridge, burritos and much more. The music was always chilled and the every dish we ordered was yummy. As well as that, the restaurant always offers daily dishes which are also great! Definitely worth going here. If you rent a scooter, never pay more than 75,000 – 80,000 Rupiah per day. 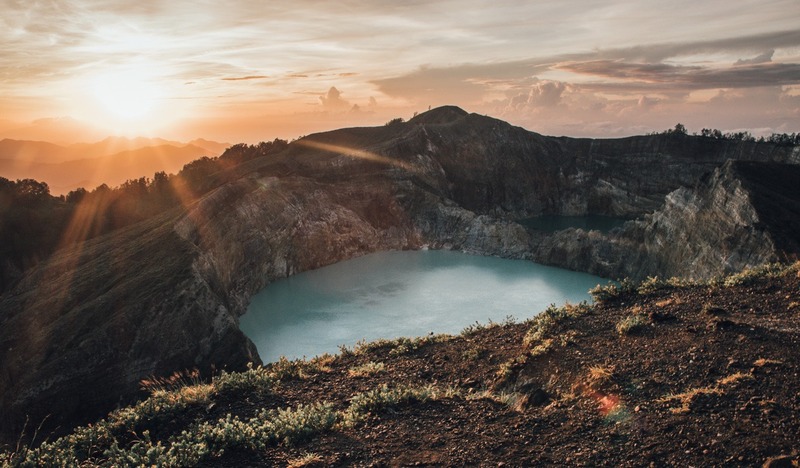 In August, locals gather around the area of the Kelimutu National Park and hold yearly ceremonies. The festival takes place on platforms in between the magical lakes and people dance, sing and celebrate together. If you want to be part of that, plan your trip in this time of the year. Especially during the sunrise tour on Kelimutu it does get cold. So definitely bring a pullover. Also during the day it normally doesn’t get a lot warmer than 23 degrees (73 F), which feels refreshing after Sumatra, Java or Bali. Every single accommodation is located directly at the main road. Here tuned scooters, motorbikes and trucks clatter through the streets in the very early morning. Bring ear plugs to enjoy your heavenly sleep with tired leg of the day before. That’s it! These were our tips regarding the Kelimutu National Park Flores. You have any questions or we forgot something crucial? Please leave a comment! Now, have fun exploring Flores. ➳ You are planning a trip to Flores? I bet you will be in Labuan Bajo! 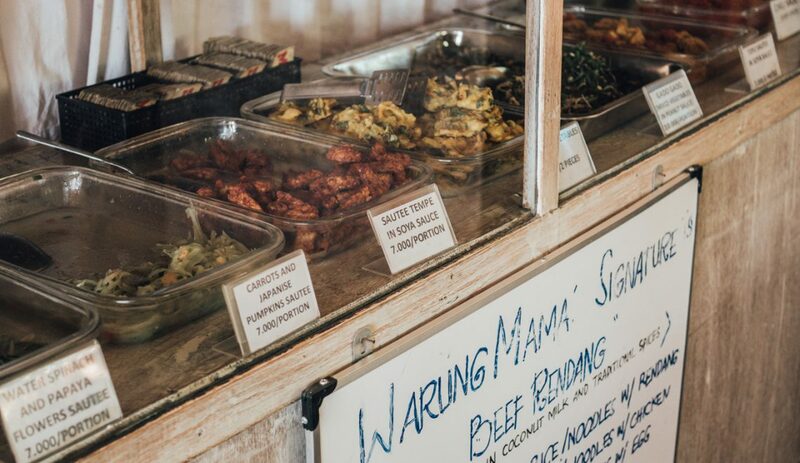 Here’s our Food Guide to Labuan Bajo! *Affiliate-Link | When you book we receive a small commission without any additional costs. 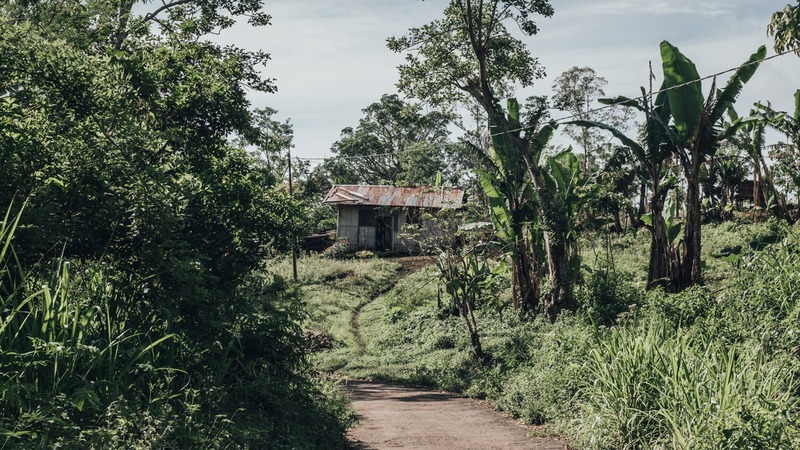 Highlights on Flores, Indonesia – The hidden beauty!